Tom Robbins tells us he once drank Mayo & Gin. : Wait Wait ... Don't Tell Me! Tom Robbins tells us about a mayo & gin cocktail, and we drink it. SAGAL: Apparently, you have a love of mayonnaise? Mr. ROBBINS: Yeah. I eat so much mayonnaise they were going to send me to the Mayo Clinic. SAGAL: But is this true, are you in fact a genuine mayo enthusiast, or are you putting us on? Mr. ROBBINS: ...mayonnaise and gin in a blender and created a new drink that my friends and I called the gin greasy, I think we called that...it was actually pretty good. 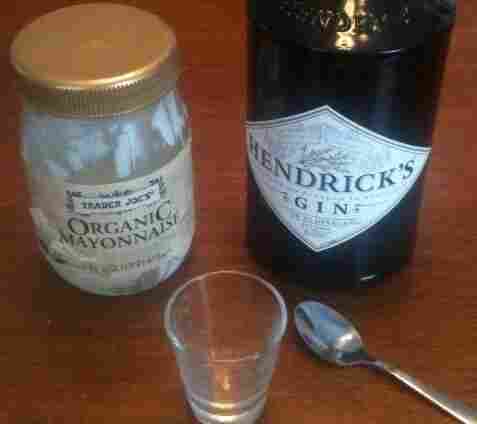 Not wanting to waste gin, or mayonnaise for that matter, I decided to go with a tiny shot, rather than a whole mayotini. Gin & mayonnaise don't combine well, probably because God doesn't want them to. So rather than a single disgusting sensation, the gin and mayonnaise battled for the title of Flavor I'd Most Regret Having In My Mouth. I had hoped even the small quantity of alcohol would provide enough impaired judgment to make the experience tolerable, but no. There's a reason people don't drink this. This is the moment where I should tell you to avoid the Gin Greasy, but that pretty much goes without saying, right?